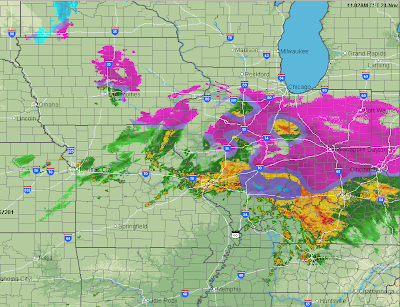 The AccuWeather radar at 11am shows light freezing rain and drizzle throughout the Midwest. In most cases the temperature is right around freezing so the ice has not become hard frozen. That said, extra caution is advised. Note the orange/red areas of heavy rain. The purple-toned areas are freezing rain and winter weather advisories. The greens are flood watches due to the heavy rain expected north of the Ohio River the next two days. And, the tornado threat will develop this afternoon or evening. As previously indicated, the I-44 area from Tulsa to Rolla should be closely monitored for watches and warnings later today.